First article inspection is to be carried out for first production parts which are produced from the process intended to be followed for normal production. The procedure of first article inspection, first article inspection documentation is managed for verify performance of product quality characteristics specified. The production lines, first article inspection should be performing on those characteristics specified on the product drawing. Prototype parts or parts manufactured using methods different from those intended for normal production process is not to be used for the First Article Inspection. The organization perform the following activities in support of the first article inspection. Remember that, first article inspection is should be carry out for first production parts. Which are produced from the process proposed to be followed for normal production. You have to verify all design characteristics during first article inspection and record the results. As well as for tracking purpose, make every design characteristics is highlight with a unique characteristics number. try to describe any characteristics with more detailed information. In case any characteristics is not measurable in the final product, must be verified during the manufacturing process or by measureable instruments. Characteristics verified at the detail level may be referenced in the production flor level first article inspection. Make the final results from inspection of design characteristics are describe in quantitative terms that i.e. variable data. When some design characteristics is describing by numerical limits. All the results recorded in the units specified on the drawing, or specification. Otherwise those results, you can have approved by customer. Attribute data (e.g. Go/No go) may be used if no inspection technique resulting in Variables Data is feasible. Attributed Data is permitted when the design Characteristic does not specify numerical limits. It is also permitted where qualified tooling is consistently used as check feature and a go/no-go feature has been established for the specific characteristic. You have change in design affecting adequate, form or function of the part. Make change in manufacturing source, process, inspection method, location of manufacture, tooling or materials that can affect adequate, form or function. Change in Numerical Control program or translation to other media that can affect suitable, form or function. Natural man-made event that can adversely affect the manufacturing process. Lapse in production for two years or as specified by the customer. After the part production, Review documentation for the manufacturing process like route card, production log book and Control plan to make sure that all operations are complete as planned. 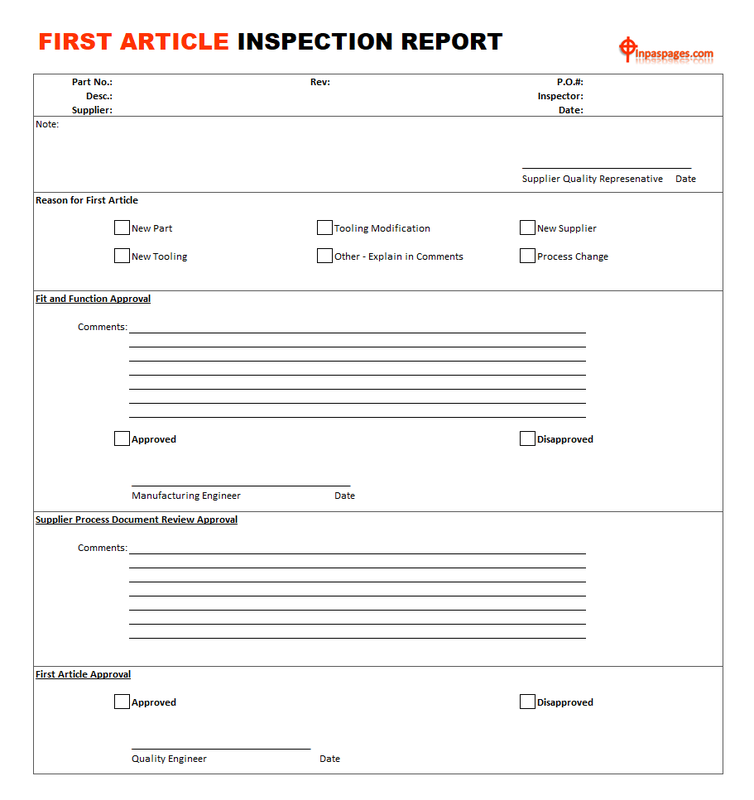 Review referenced exhibits supporting the first article inspection like inspection report, test report for completeness. You have to Review non conformance documentation if any for completeness. Material review certificate for completeness. It is require to verify that the approved special process sources are use. And that the route card calls out the correct specifications. You have to verify that Key characteristics requirements should be meet. Generally, part verification specific gauges and tooling is qualified and traceable. You have to verify every design characteristic, which are accounted for unique code. Inspection results traceable to each unique identifier, or specific tracking code.